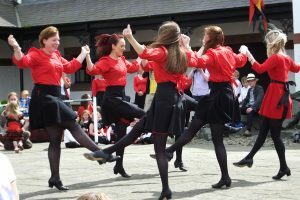 With the popular Cornish festival Lowender Peran on schedule for early November, Manx participants will soon be packing their musical instruments and dancing shoes for this annual extravaganza, but this year’s invited group could prove to be a bit of a red herring. Lowender Peran is a long established event set up to encourage recognition of both Cornwall’s heritage and links with their fellow Celts in a relaxed and informal setting, which has proved highly successful. The Cornish people have a proud history of a distinctive, expressive identity, recognising and valuing not only their own roots and personality, but those of others. Although largely known for perennial favourites such as the ubiquitous pasty, the eye-catching stargazy pie and, of course, the area’s stunning scenery, many Cornish people acknowledge that in order for Cornwall to survive as a distinct entity, each generation needs to show those up-and-coming that culture too has a presence within that list. It’s a banner which has been picked up with gusto over the years, leading to the all encompassing Lowender Peran, which this year will be moving to a new destination at the Hotel Bristol in Newquay – set on the majestic cliff top and enjoying wonderful views of Tolcarne Beach. The Isle of Man enjoys a long standing friendship with the Cornish crowd, which continues this year with one of the newest local groups Skeddan Jiarg (Manx Gaelic: Red Herring). 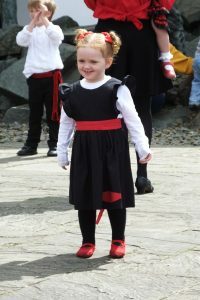 Established in 2014, it’s a healthy cross-section of young adults and their children who have come together in the west of the Island to practice and display Manx dancing both at home and abroad. Distinctive and vibrant at every opportunity, you’ll find them tackling a combination of both traditional and newly created dances from as young as three years old!